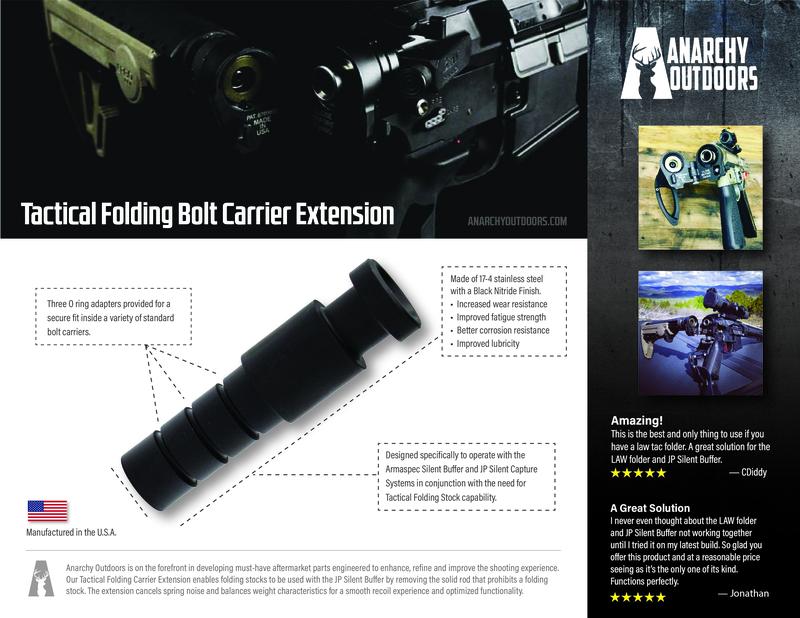 Our unique Tactical Folding Bolt Carrier Extension is a problem-solving masterpiece for use with any and all Folding Stock adapters. If you're running the JP Silent Buffer and want Tactical Folding Stock capability, it's the Anarchy Outdoors Tactical Bolt Carrier Extension or nothing! Can be used with the Law Tactical GEN 3-M AR Folding Stock Adapter, JP Silent Buffer and other folding adapters found on the market. The Black Nitride finish improves fatigue strength, lubrication, wear resistance, and corrosion resistance. Ordering simple. Shipping super quick. Product for for my complete custom M4. Installed a law tactical. Wanted to run a JP captured spring because they rock. This extension was flawless. Used the smaller O rings on the back of my Areo precision bolt. Runs like a date. A solid operational product. Highly recommended. The washer on the JP was getting a little hung up initially. Smoothed out the inner bore with a bit of sandpaper and now runs perfectly. I used the small o rings. Fit perfect inside a PSA carrier group. Ran great on my suppressed 300BO. Great product, thanks! This is the best and only thing to use if you have a law tac folder.